Autumn is finally upon us. It happens to be my favorite season (Although it does mean Winter is coming YUCK!) I love the colors of the leaves changing, the smell in the air, the chill in the air. I also love soup! Fall is the perfect time to try different soups. This one does not disappoint! The best part about it is that it doesn’t have to sit all day and simmer. It only takes about 20 minutes to make! 1) Heat a large skillet over medium high heat. Add bacon and cook until brown and crispy, about 6-8 minutes. Transfer to a paper towel-lined plate; set aside. 2) Melt butter in a large stockpot over medium heat. Add garlic and onion, and cook, stirring frequently, until onions have become translucent, about 2-3 minutes. Stir in corn and oregano until fragrant, about 1-2 minutes. 3) Whisk in flour until lightly browned, about 1 minute. Gradually whisk in milk, and cook, whisking constantly, until slightly thickened, about 1-2 minutes. Stir in potatoes. 4) Bring to a boil; reduce heat and simmer until potatoes are tender, about 12-15 minutes. Stir in ham,cheese, salt and pepper, to taste. 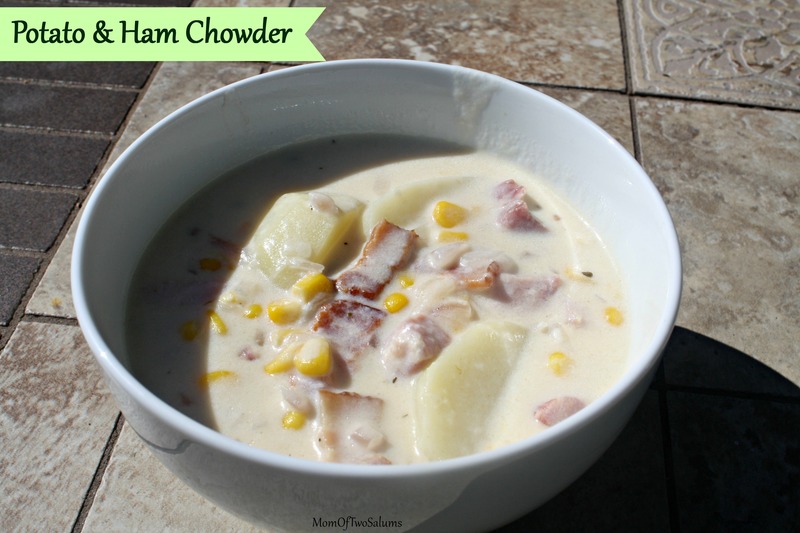 If the chowder is too thick, add more milk as needed until desired consistency is reached. 5) Serve immediately, garnished with bacon, if desired. I had it for lunch, dinner and lunch the next day. I can’t stop eating this stuff! I am planning on making a dbl batch next time so I can freeze some of it. ← Brand New Etsy Shop! !